Dr. Glaser and the team at Glaser Orthodontics are experts in treating their patients in Montrose, NY, especially teens, with Invisalign clear aligners as an alternative to traditional metal braces. Invisalign Teen aligners are clear, removable, thermoplastic trays that a exert a gentle pressure to shift teeth to their optimal positions within the mouth. 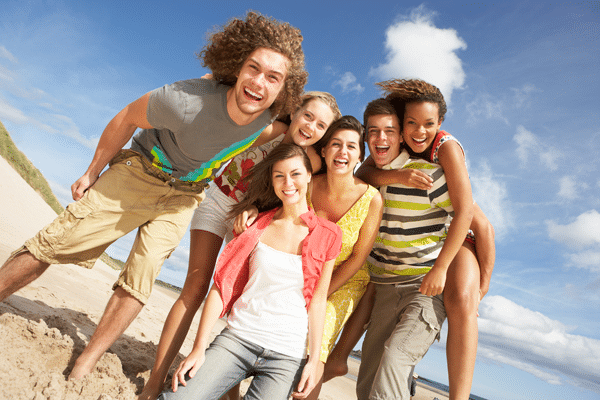 These benefits are especially important to teens who need orthodontic treatment. Easy to Wear. Invisalign Teen is made of a clear, removable, thermoplastic material. They are smooth plastic, so there are no sharp metal edges to irritate soft mouth tissues. Invisalign is clear and invisible to the casual observer. Most people never know someone is wearing Invisalign. It is virtually invisible and can alleviate some of the self-consciousness that teens may feel while undergoing orthodontic treatment. Easy to Remove. Treatment with Invisalign involves wearing a series of removable aligner trays that patients change out themselves every two weeks. The Invisalign aligners can be taken out to eat, brush, floss, and clean the trays. It does not require a teen wearer to alter their eating habits or their morning routine. Invisalign is easier to keep clean than traditional braces. With Invisalign, you simply brush the aligner after you brush your teeth. Shorter treatment times. If worn correctly, the course of treatment with Invisalign may be less than treatment with traditional braces. A course of treatment with Invisalign may last a year and a half, while treatment with traditional braces can take longer. Less discomfort. A sense of pressure or discomfort may be experienced when traditional braces and wires are tightened. If the wires of traditional braces break, they can cause irritation to the soft tissues of the mouth. There is often less discomfort associated with Invisalign than with traditional braces because there are no metal bands or brackets to cause irritation. Less maintenance. Because Invisalign Teen is removed to clean the tray and the teeth, the care and maintenance of the aligners require less attention than traditional braces. Teeth and trays are cleaned simultaneously. Traditional braces require more attention and commitment to stay clean because brushing and flossing are more difficult with bands and wires attached to the teeth. Dr. Glaser knows that treatment for teens with Invisalign teaches the wearer responsibility and accountability. The care involved in successful treatment with Invisalign is not difficult, but it requires conscientious and consistent attention. Far less intricate than cleaning traditional braces, Invisalign is the clear alternative to braces. For more information on Invisalign in Montrose, NY, or to schedule an appointment with Dr. Glaser, please contact Glaser Orthodontics today!